The world-famous dry-cured ham is most often served quite simply as an antipasto (before-meal appetizer), either by itself (perhaps wrapped around thin breadsticks called grissini), or as part of a salumi assortment platter, often accompanied by cheese, with some bread to temper the saltiness. And there's certainly nothing wrong with enjoying it that way, particularly if it's really high-quality prosciutto. But there are many other ways to use prosciutto, and aside from its obvious inclusion in many different recipes (saltimbocca comes to mind: thin veal cutlets topped with prosciutto and sage), this list considers quick and easy pairings, either using it crudo (uncooked) as-is, paired with other ingredients, cooked or uncooked, or giving it a quick transformation to vary its role on your table. Thin slices of prosciutto have traditionally been served wrapped around wedges of cantaloupe or sweet, ripe figs -- the dry, earthy saltiness of the prosciutto and the cool, juicy sweetness of the fruit make for a perfect pairing to start a meal on warm evenings, accompanied perhaps by a chilled glass of prosecco. A wonderful sandwich can be made by layering prosciutto slices and thin slices of fig between two pieces of focaccia. You can riff on this match made in heaven by trying pairings with other, similar fruits -- (peaches, mango, apricots, or nectarines come to mind), or replacing the fresh fruit with, for example, a melon, fig, or peach sorbetto, for an even more refreshing antipasto! Or try stuffing the figs with fresh ricotta, and perhaps some toasted walnut pieces, then wrapping them in prosciutto, to make the treat even more decadent. In Tuscany, fresh, hot, chewy fried dough balls with the adorable name of coccoli ("chubby babies") are often served together with thick slices of prosciutto and a soft, mild cheese called stracchino. Wrap a slice of prosciutto around a hot, pillowy coccolo, pop it into your mouth, and you will be transported to a happy, chubby-baby food place. Layer a plain Neapolitian-style pizza margherita with slices of fresh prosciutto and generous handfuls of fresh arugula, and you've got a one-dish meal. Prosciutto is often wrapped around small bundles of steamed, blanched, roasted, or grilled asparagus, and served as-is, or then passed under the broiler until the prosciutto is crisp and browned (the combination I prefer is broiled or grilled asparagus and raw prosciutto). You can try this idea with other vegetables as well: How about green beans or artichokes? Or saute green peas with small strips of chopped prosciutto and serve with fresh mint. Finely chop slices of prosciutto into small, thin strips and fry them over medium-high heat in a skillet until crisp. You can use these as a topping for salads, soups, pastas, risottos...or anything else you can think of! Think of it as bacon bits...but much, much better. 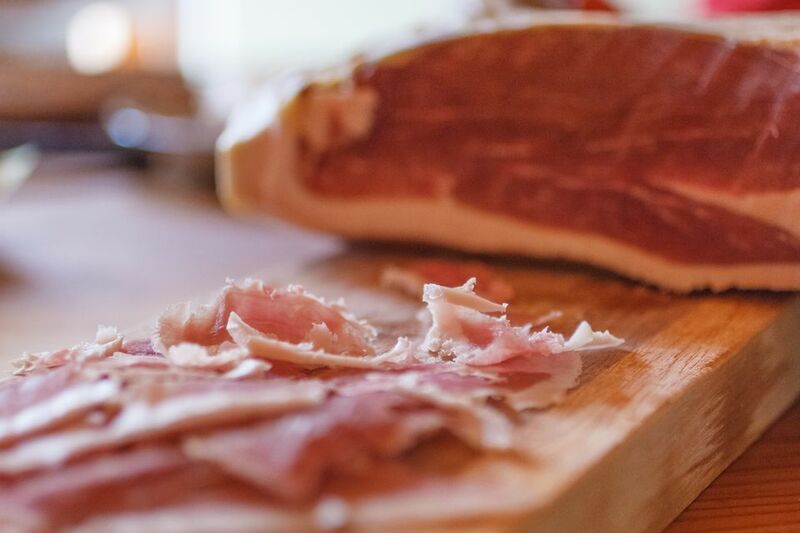 Want to Try Making Your Own Prosciutto? I'm not going to lie to you: It is not an easy nor quick process. But if you're a truly hard-core DIY-er, here is a detailed description of the process.